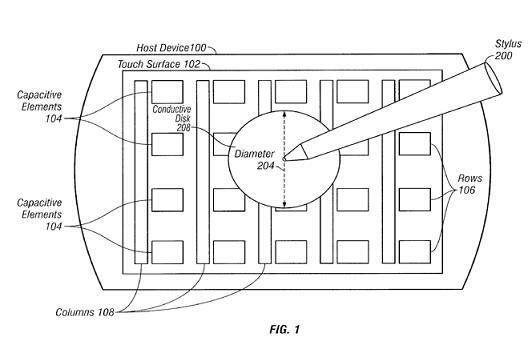 Previously we mentioned about HTC Innovative Patent Idea of getting future stylus to work on capacitive touch screen, now seems that Apple Inc, the famous iPhone maker has actually investigating similar approach by filing a patent idea with capacitive touch stylus to work on its existing finger-friendly capacitive touch sensitive display. The patent with titled of “Stylus Adapted For Low Resolution Touch Sensor Panels” is based on a conductive metallic tip that being built into the stylus itself, emulating the similar effect of what can be achieved by human fingers when tapping on capacitive screen. Besides, it also mentioned about a powered stylus that can achieve the same goal but with additional functions like ability to include sensors to measure force and angle that enhance controls such as executing specific functions (for changing colors, line width) for greater user experiences. No doubt, now capacitive touch is quite famous especially in high end smartphone where users can experience the multi-touch with drag and drop capability, but when comes to fast tapping with high accuracy, stylus is still a better option. However, no firm plan on when it will be put into action or it could purely an innovative idea that stays in patent office.